Molecular tools have been increasingly used in identification and taxonomy studies of Pochonia (Clavicipitaceae). In recent years there have been important advances in Clavicipitaceae taxonomy, including resolving the differences between Verticillium and Pochonia through ITS sequences molecular analysis. Current molecular identification of Pochonia spp. relies on different sets of molecular markers to differentiate species, varieties, and host-preference biotypes. The diversity of Pochonia spp. populations has been studied through several genomic fingerprinting techniques, such as RAPD, SCAR, ERIC and REP. Quantification of the fungus in soil and roots can be made using quantitative PCR in combination with other classic microbiological techniques. It is well known that the genus is complex and the current classification is mainly based on the phylogenetic analysis of several genes such as β-tubulin, ITS, nrSSU, nrLSU, rpb1, rpb2 and EF1-α. 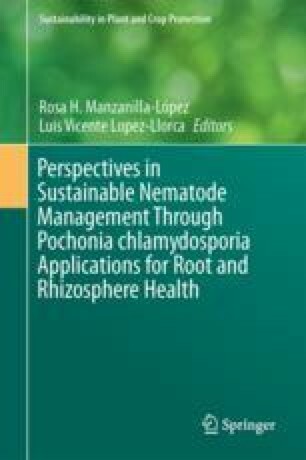 Molecular advances and recent genome sequencing of Pochonia chlamydosporia has opened a new era in the study of this important fungus, thus broadening the possibilities for studying the molecular mechanisms of differentiation, pathogenesis and diagnostics within Pochonia spp. Giné, A., Carrasquilla, M., Martínez-Alonso, M., et al. (2016). Characterization of soil suppressiveness to root-knot nematodes in organic horticulture in plastic greenhouse. Frontiers in Plant Science. doi: 10.3389/fpls.2016.00164.